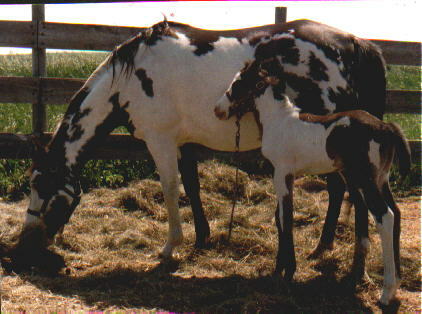 "Shiloh at 1 week old w/dam; Sheila McCue"
Shiloh was born May 29, 1988, in South Dakota. His sire is a black overo stallion named, "Kingfisher McCue," who passed away in late January of 1998, at approx. 15 years old. "Shiloh at 10 years old on Rumpkump Ranch in Minnesota"
We've been asked several times how we were able to acquire Shiloh McCue. Since he is well known throughout Minnesota and his siring abilities we are told, are nothing less than influential, one would think we paid an arm an a leg for such a fine animal. As with everything, the most expensive product isn't always worth the most and the cheapest, isn't always awful. Shiloh, we feel was a true bargain.... I bought my first mare; "Me Tonto Bunny"(19 years old)--chestnut quarter mare-- bred to Shiloh's daddy)in 1988, from a gal in South Dakota for $500.00. The following year, the mare produced a beautiful black overo filly that looked identical to her sire; "Kingfisher McCue." I called the filly, "Jasmine McCue." That year I planned to breed the mare back to Kingfisher. It turned out that my boyfriend at the time, got hurt in a horse accident(the horse flipped over backwards and the high back saddle horn caught him in a kidney and severed it). My plans were cancelled for the year. I made it a point to breed to Shiloh McCue(the son of Kingfisher McCue) the following year. Little did I know that Shiloh would be up for sale by the end of 1988 and who knows where he'd end up. My chance for breeding to him would be hit and miss, then. The lady had wrote me a letter explaining how much she wanted for Shiloh McCue(a yearling then) and the different kinds of arrangements that could be made. You know something??? I got competely sick when I heard that Shiloh was going to be sold. I must've called her three times that following weekend, trying to strike a deal with her!!! In the end....She delivered Shiloh to Minnesota and brought the filly, "Jasmine McCue(3 mo.s old at the time)," back home with her. The name Jasmine was later changed to Kimba because the lady always wanted a Kimba(who was later sold) and she thought it was only fitting because she got her from me. As for the old mare; "Me Tonto Bunny," she never settled again and we sold her at our local sale barn as a riding horse a year or two later. 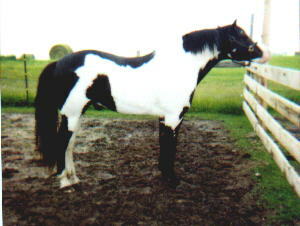 She was 21 years old at the time and brought $510.00 in the sale ring, of which I got $480.00 of it. So, it would seem that Shiloh cost me $20.00 from the original purchase and whatever it cost extra to feed the mare for a year or two. Now, after all this time, i'd like your input. Just look back through the pages. You be the judge. Let me know if he was a bargain or not. He's isn't perfect, he's never been shown. I'll guarantee you tho', he has foal power!!! 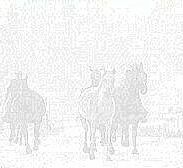 They are out there-- getting shown, in halter, western pleasure, reining and cattle events. If you were to ask me what it would take today to own him--I'd tell you, nothing less than $100,000.00.